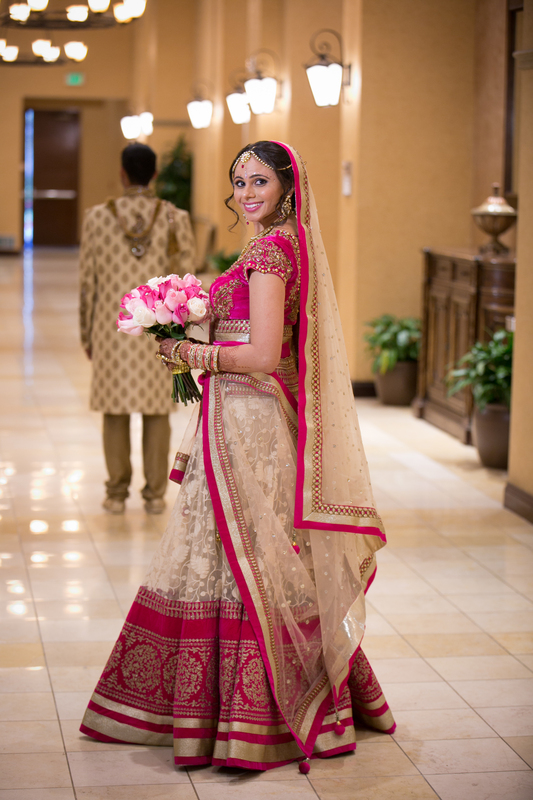 Shilpa of Shilpa Patel Events and I worked together quite a bit on the weddings she does. 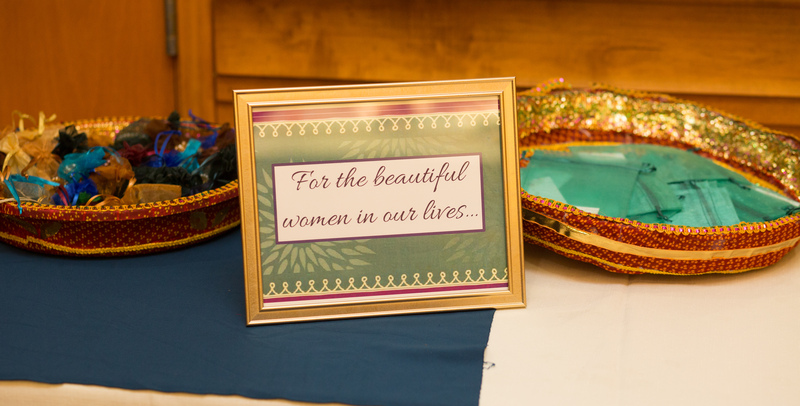 So we did our own scouting and designing; it was very rewarding to see our vision come to life on the wedding day. 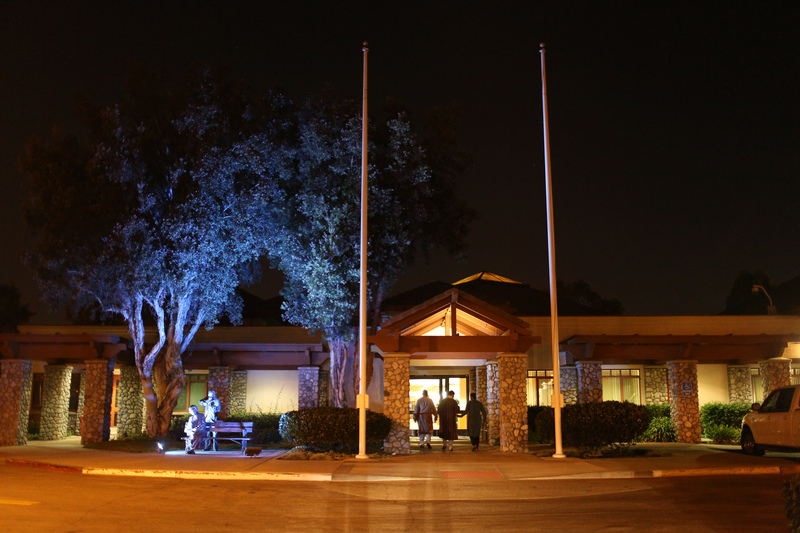 Our sangeet was at the Cerritos Senior Center at Pat Nixon Park. It was a great opportunity for our extended families and friends to meet and get to know each other. There were about 150 people that night and our whole weekend. 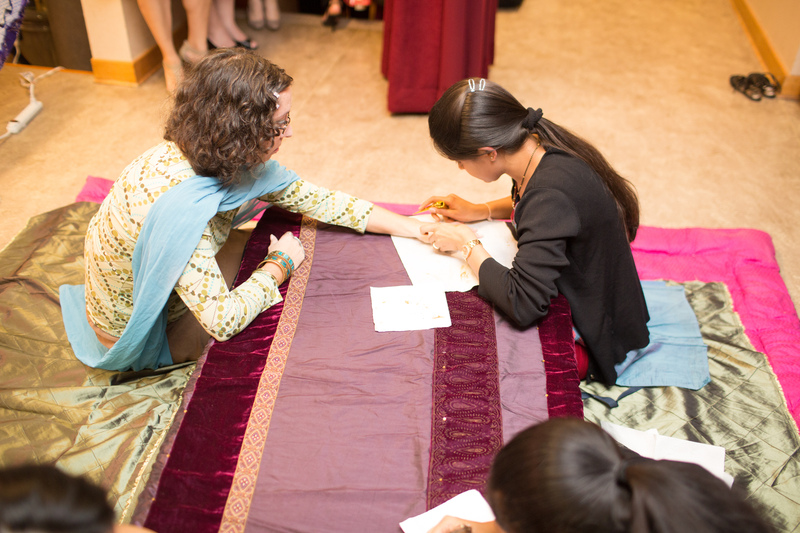 We had a mehndi artist, a DJ that who played great music, even some Gujarati songs for a little garba time. Did you consider any other venues? Yes, we looked at a few places. 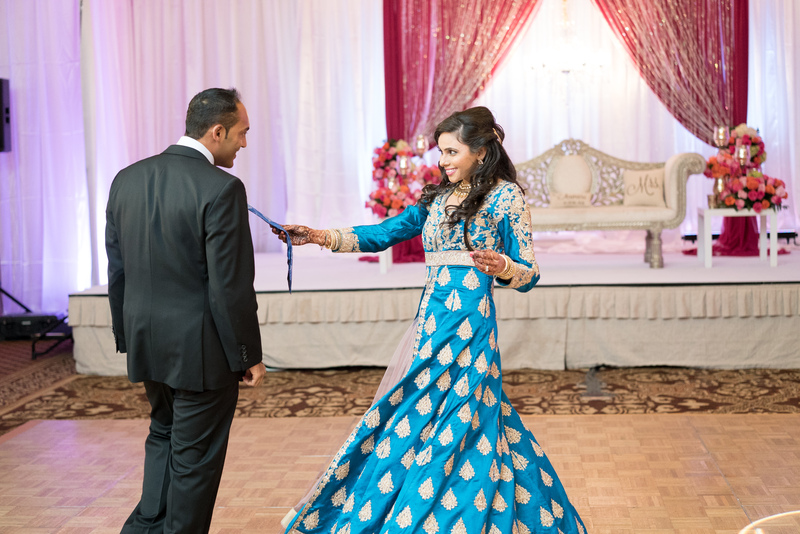 We were looking for a low key venue with good parking, a good location for our guests flying in and family near by, a place that felt more private, and matched our budget. 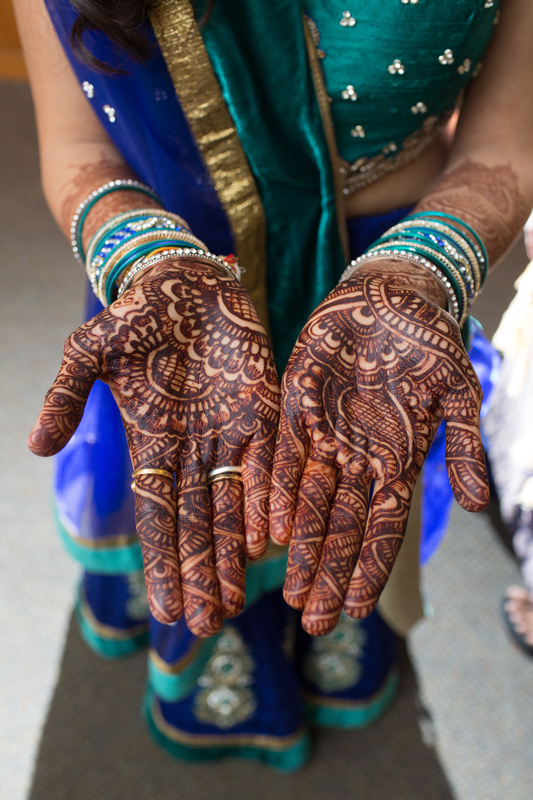 Where did you get ready for the sangeet? Getting ready was super convenient. 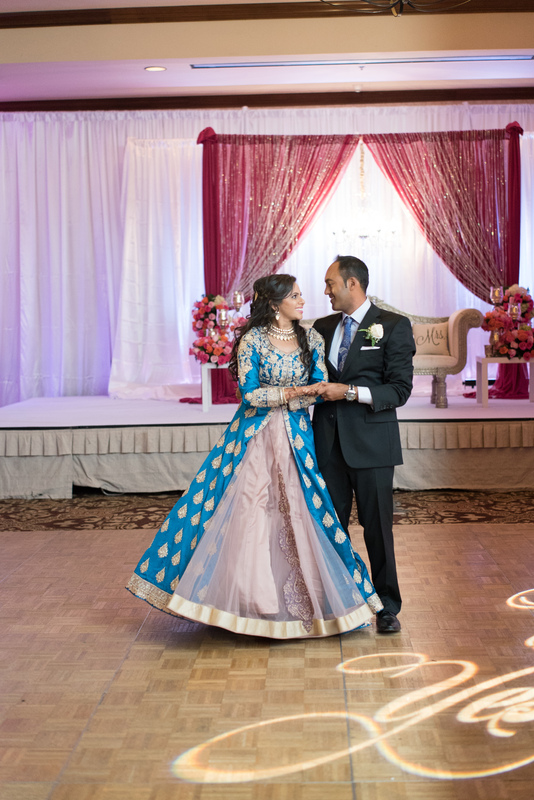 Since our sangeet was in Cerritos, I got my hair and makeup done at a local place on Pioneer Boulevard (LA’s Little India). 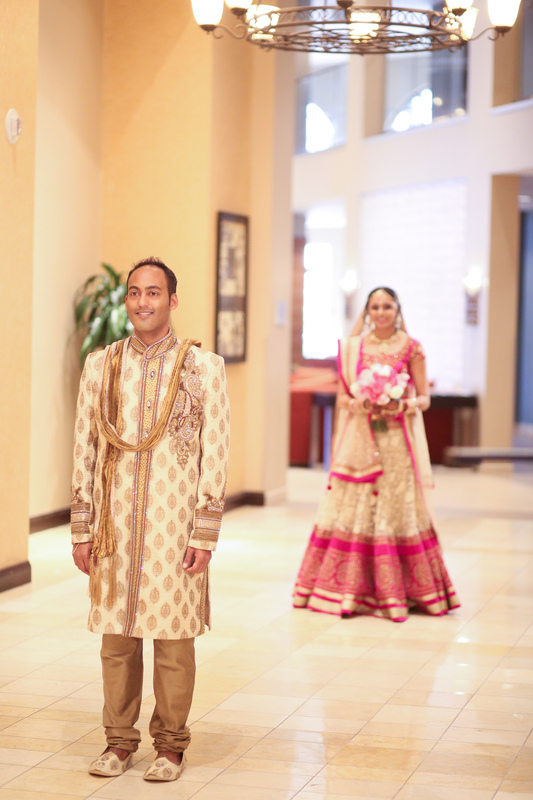 We checked into the wedding venue hotel that night, so I got ready there on the wedding day. 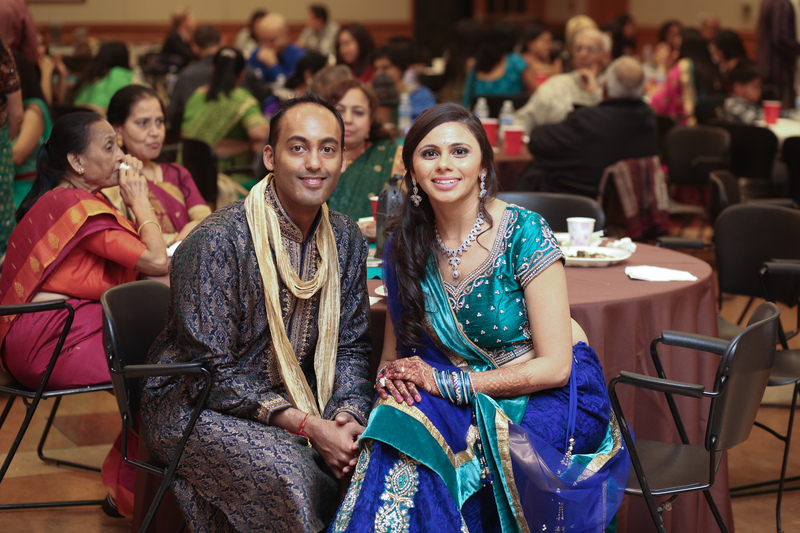 What cuisine did you serve at the sangeet? We had Mexican food. 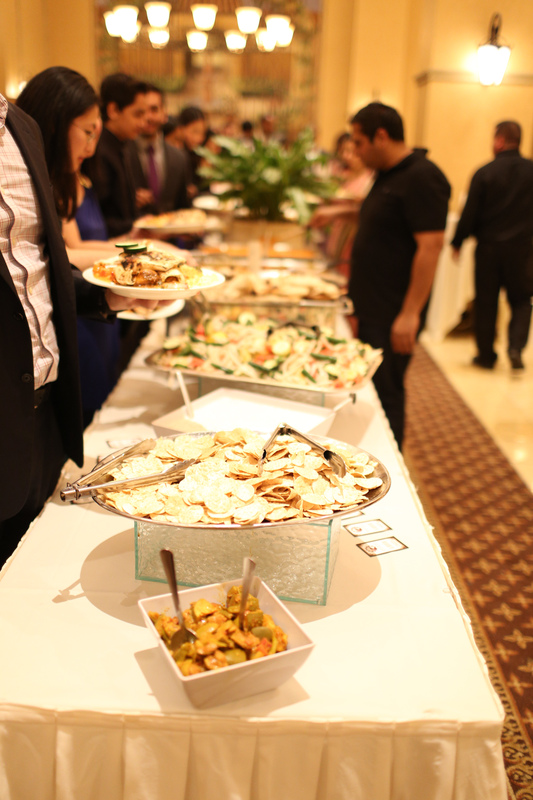 Our guests loved it as it provided some variety and they had great vegetarian options as well. 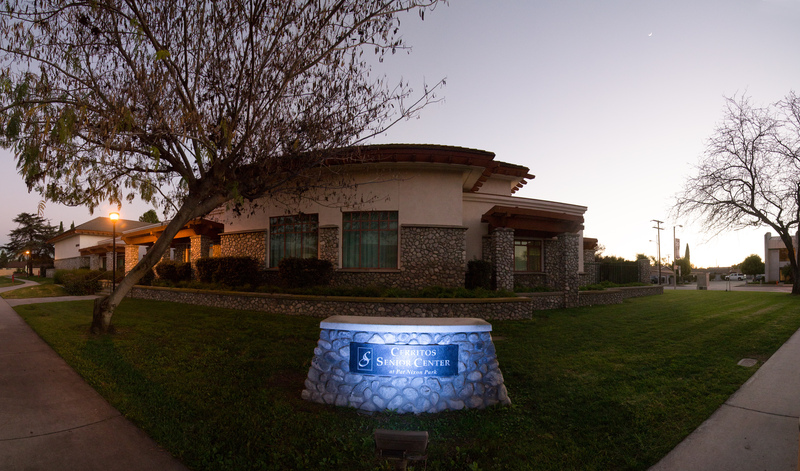 They had really good Yelp reviews, and are based from Stanton which isn’t far from the venue. 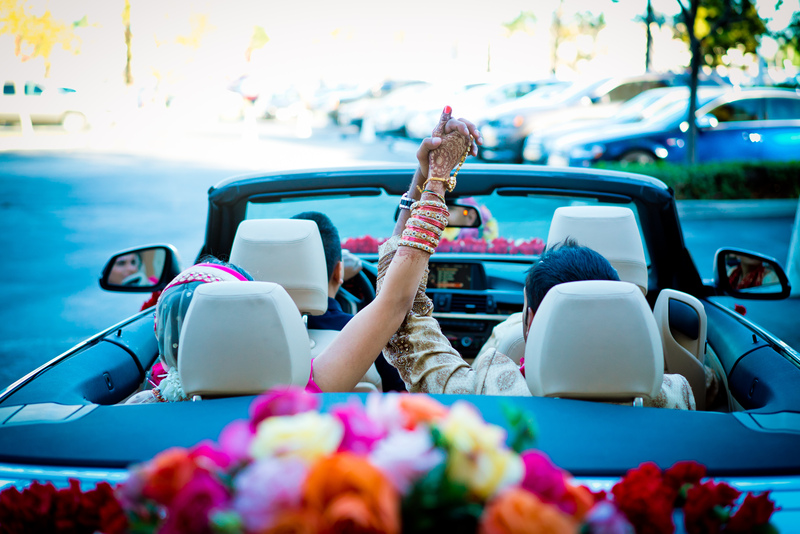 We got married at the Wyndham Anaheim Garden Grove. 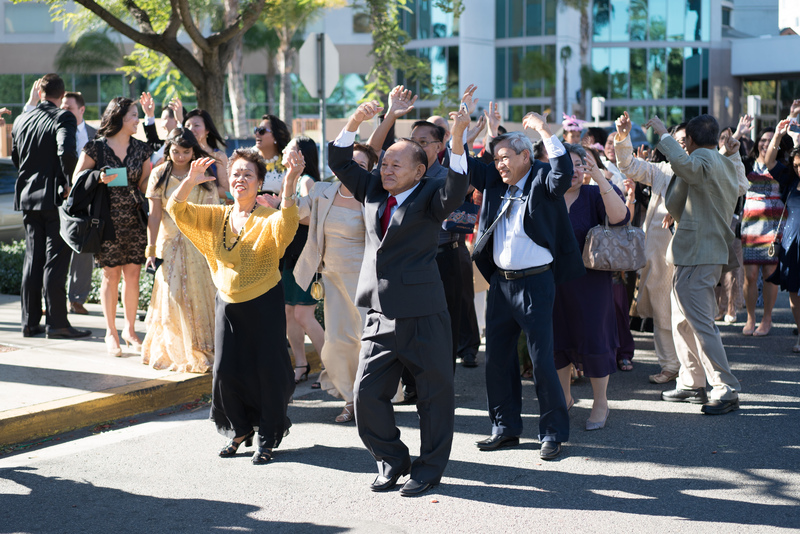 Having an open bar and location were important to us; we were looking for a venue in the North Orange County / Anaheim area, and weren’t too concerned about a venue that allowed an outdoor ceremony since we got married in January. 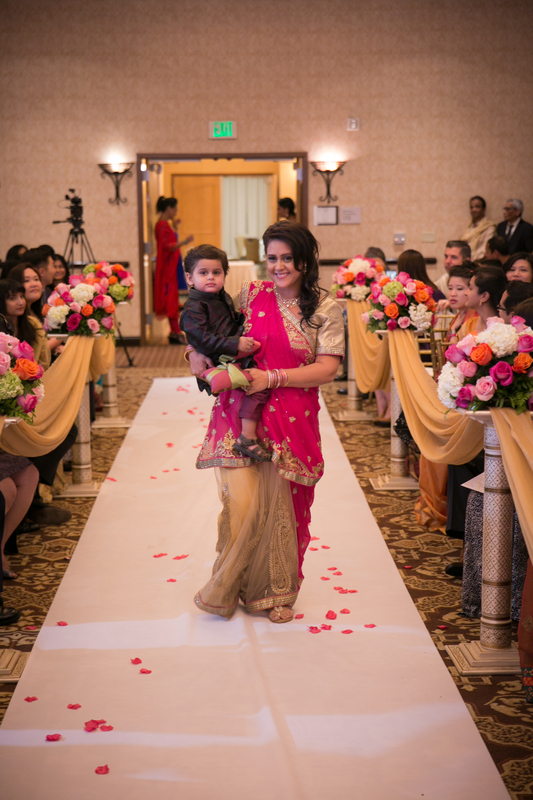 We needed a venue that allowed us to have an indoor Hindu ceremony, and since our guest count was around 160 we didn’t want to be swimming in a massive ballroom. 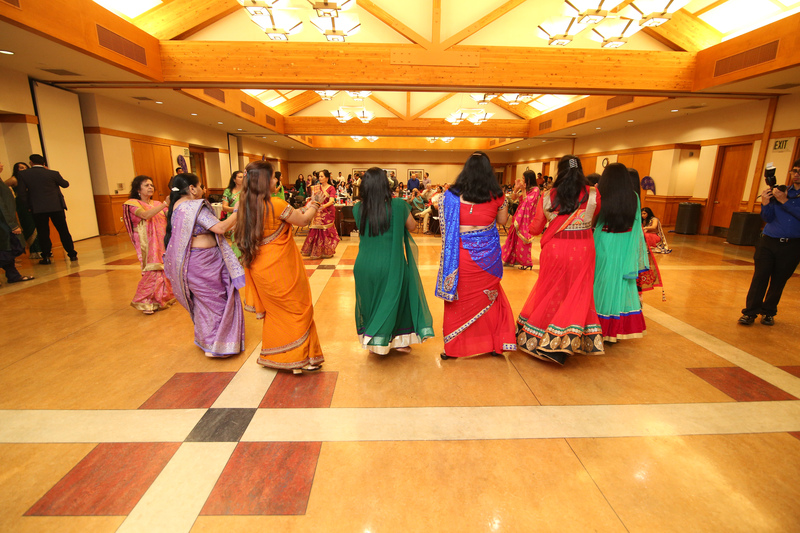 With Shilpa’s help we narrowed down the venue from a long list of those that fit the criteria above. 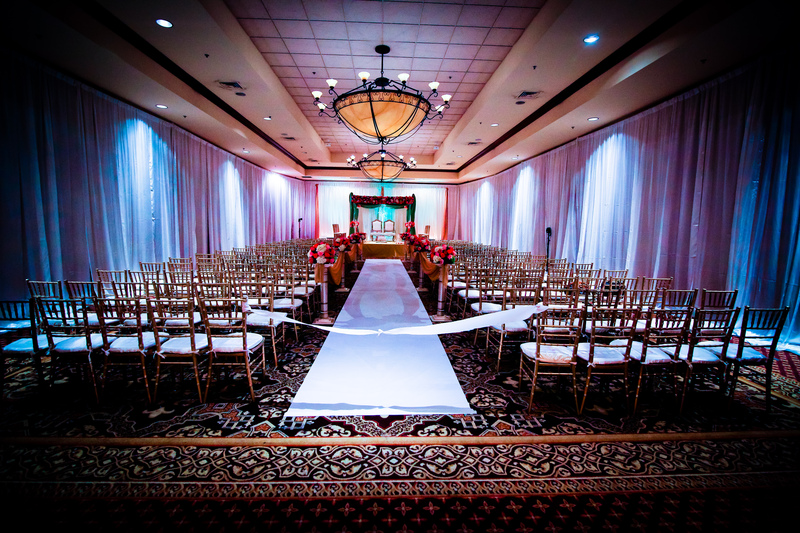 We were already familiar with the venue and had a great previous experience there. 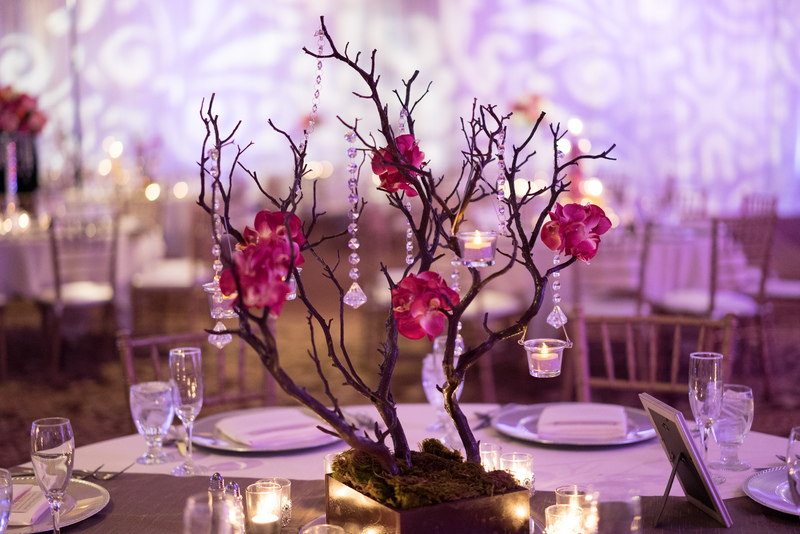 How did you vet venues? Raj and I had a marathon 10 hour day where we went to look at 8 to 10 venues and from there we knew what we were getting into at the Wyndham. 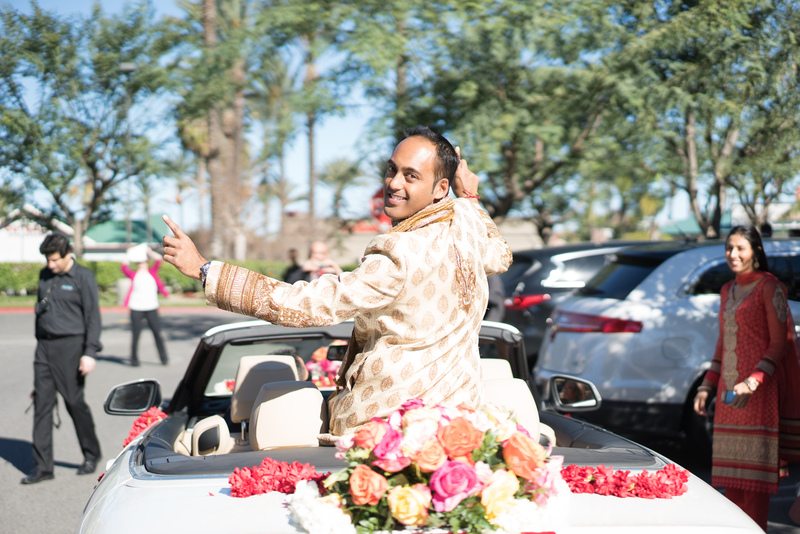 We liked the baraat route, the complimentary ample parking for guests, their indoor ceremony space, that they are well versed in Hindu weddings and the ceremonies involved, they allow outside catering which was huge for us, the staff was friendly and their pricing fit our budget. They didn’t charge us for a fire watch since we did the ceremony indoors – so for many reasons the Wyndham was perfect for us. 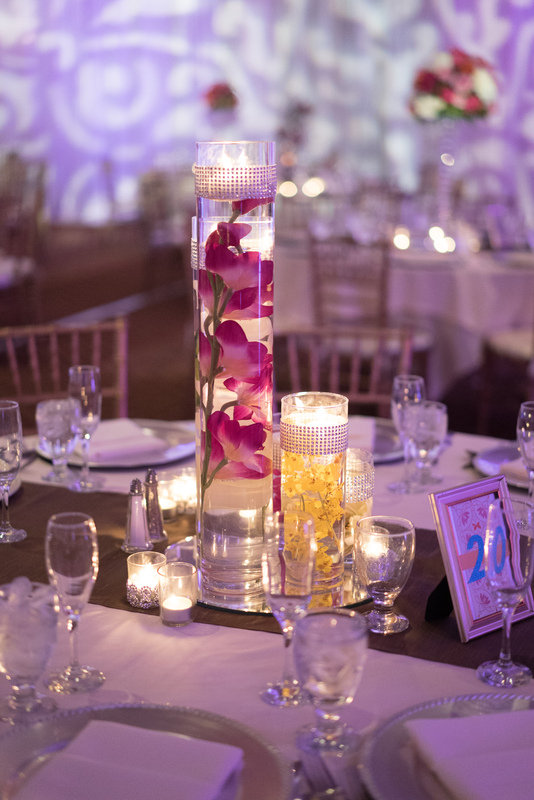 Can you tell us about the schedule of your wedding day? 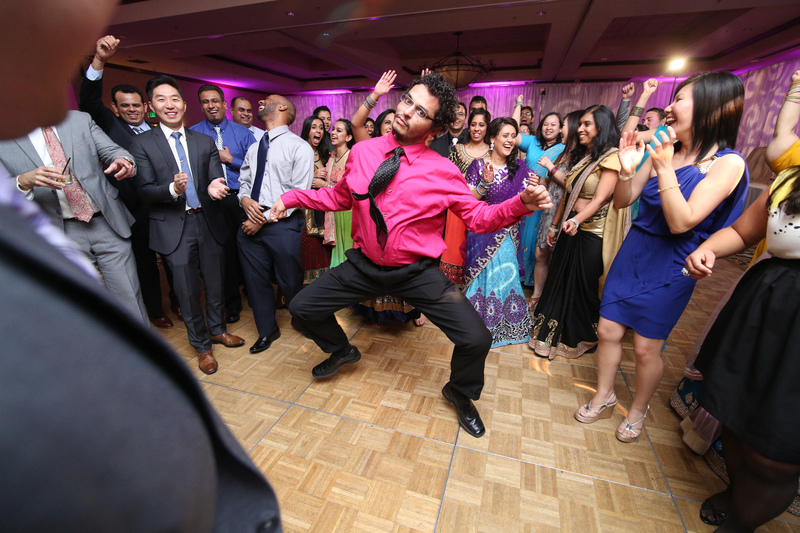 Sure, there was a short gap in-between the wedding and reception. 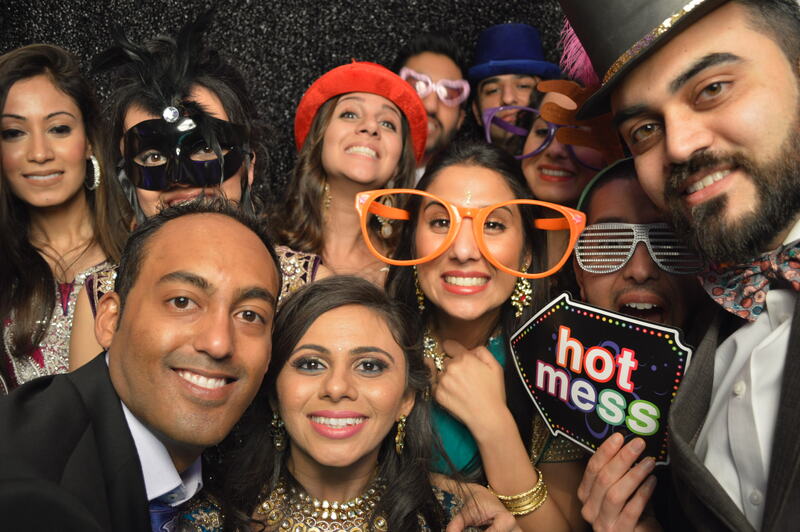 The wedding started at 1pm and finished by 4pm – including the vidaii. 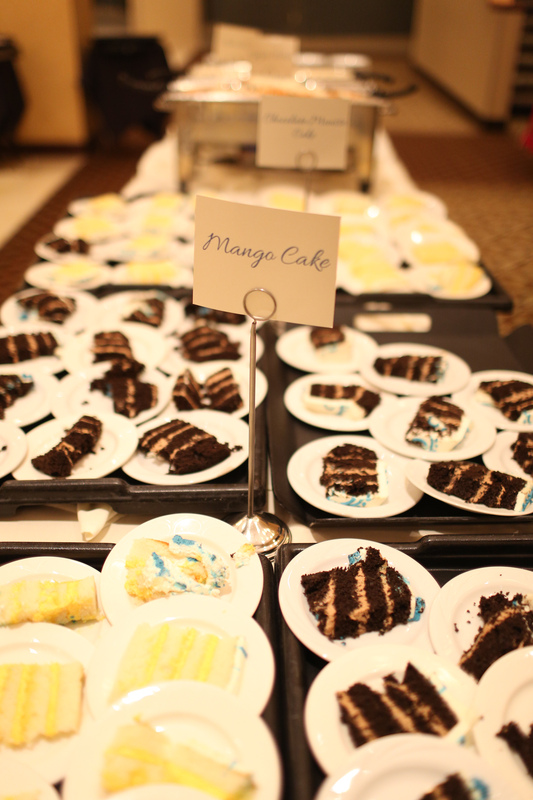 We served snacks in the foyer outside the ballroom part way through the ceremony. Did you use the same space for the reception? Yes. The ballroom is partitioned in three parts. 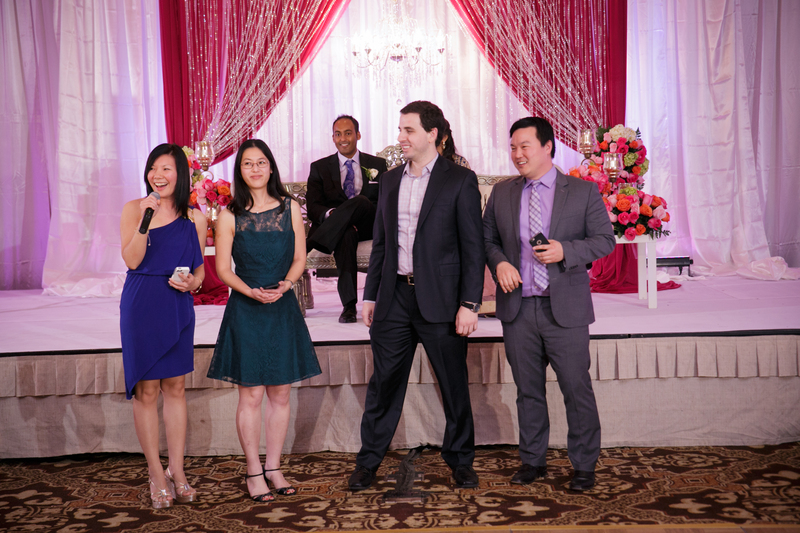 – we utilized the middle portion for the wedding ceremony, with the plan to use the whole ballroom for the reception. 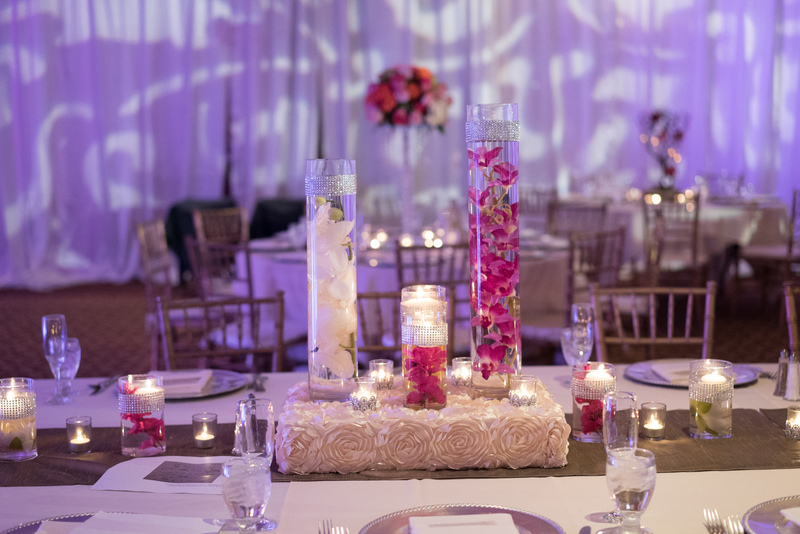 While the middle portion was being used, the other two portions were being set up for the reception. 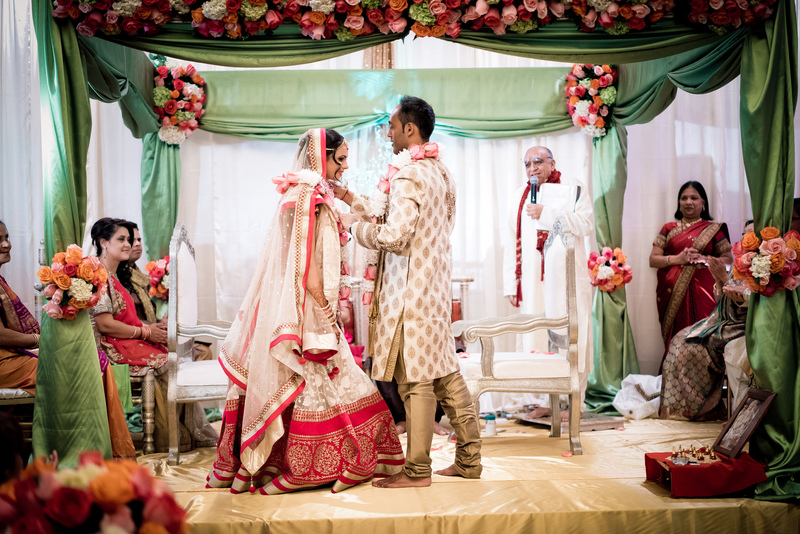 We very meticulously planned everything with Shilpa’s help. We were also very fortunate to have friends who arrived early in the morning and helped with parts of the setup. 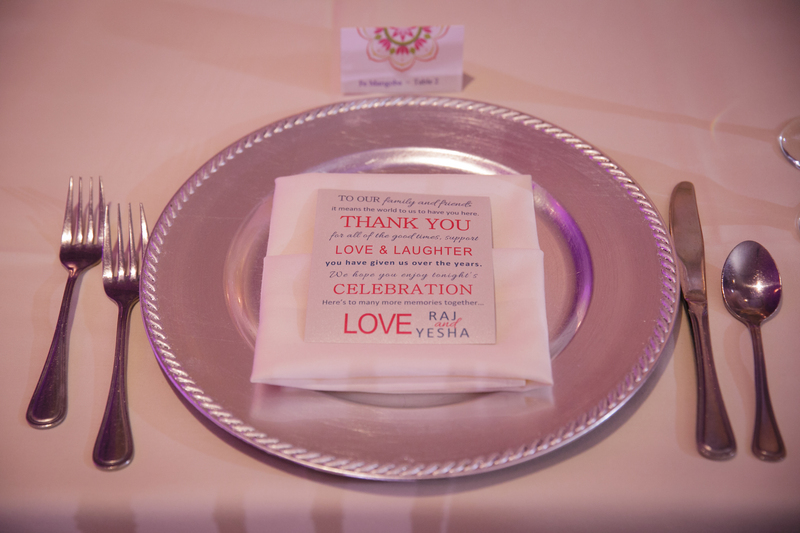 We wanted to thank each of our guests for taking the time to be there, and placed thank you note on each plate setting too –seeing how helpful our friends were that day it just reinforced how appropriate that gesture was. 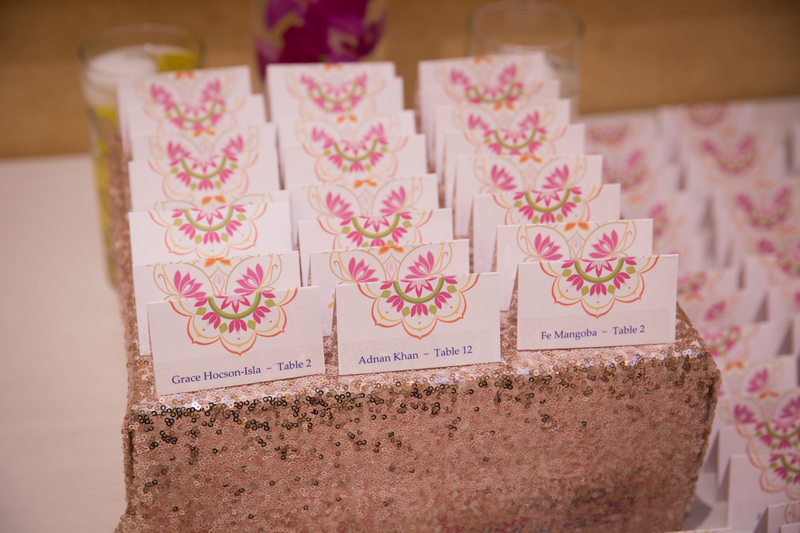 Did you have circular tables at your reception? 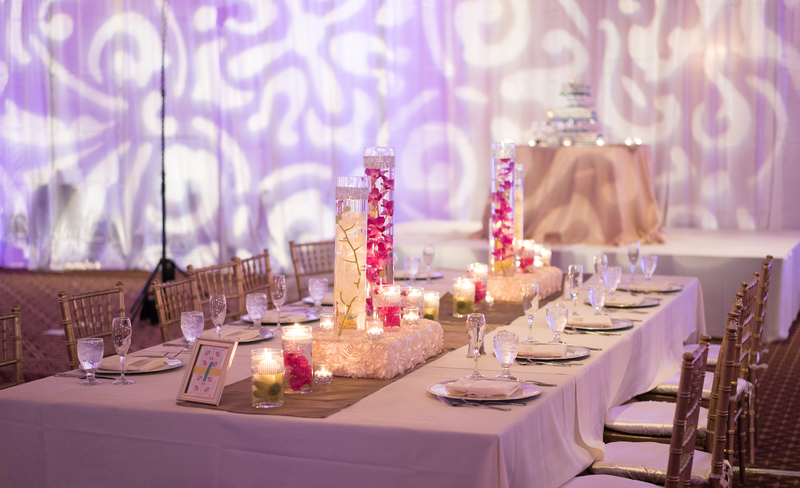 Most of our tables were rounds, but the head tables were rectangles placed on either side of the dance floor for our immediate families. Did you use their standard banquet chairs or did you bring in chairs? 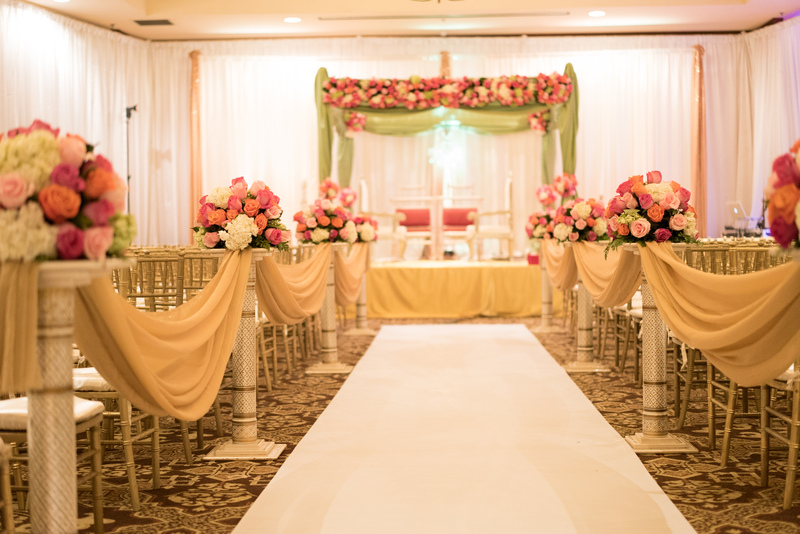 We rented chiavari chairs from Deepti’s Florals, they bring an elegance to the whole room. 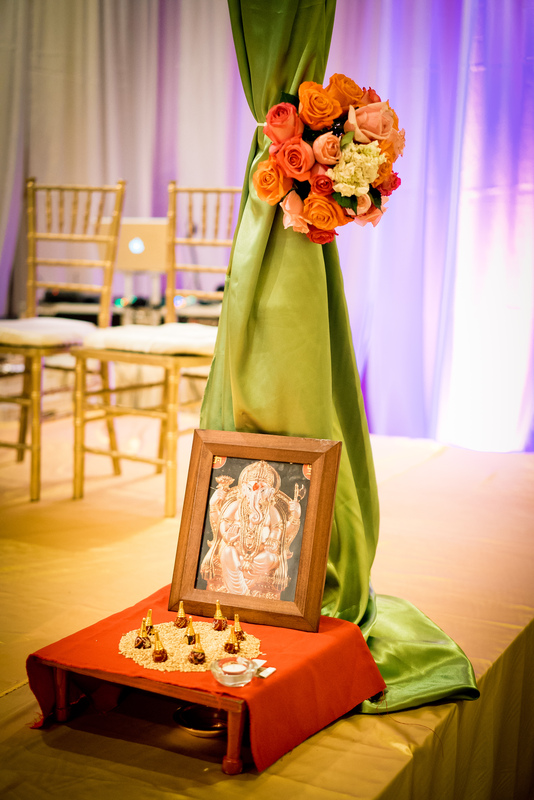 Deepti also did all of the flowers and décor for the wedding ceremony as well as the majority of the décor for the reception. 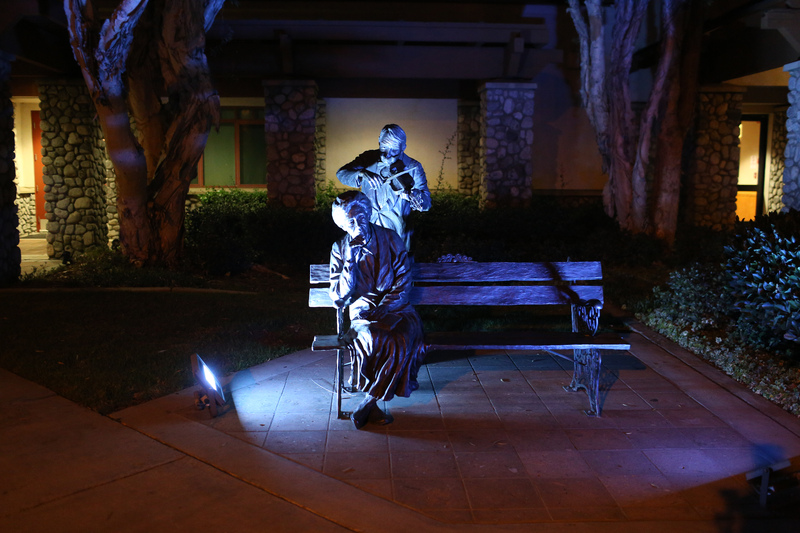 Did you do any special lighting? 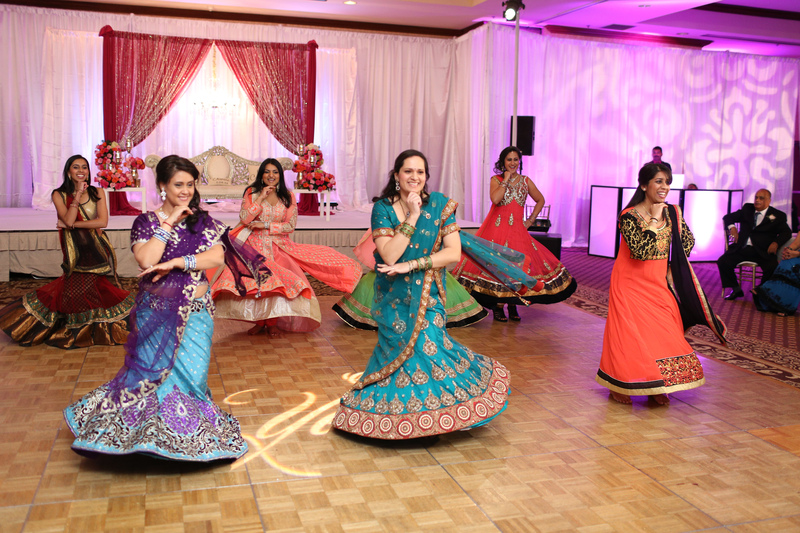 We worked with Dhamaka Entertainment. We had about 20 up-lights, wall art on 3 walls and had the whole room draped. They did a fantastic job. They did our lighting and Kamal was our DJ for the day. At first I tried shopping online. Nothing was coming out the way I wanted in terms of look or fit. So we ended up going to Ahmedabad. How was shopping in India? 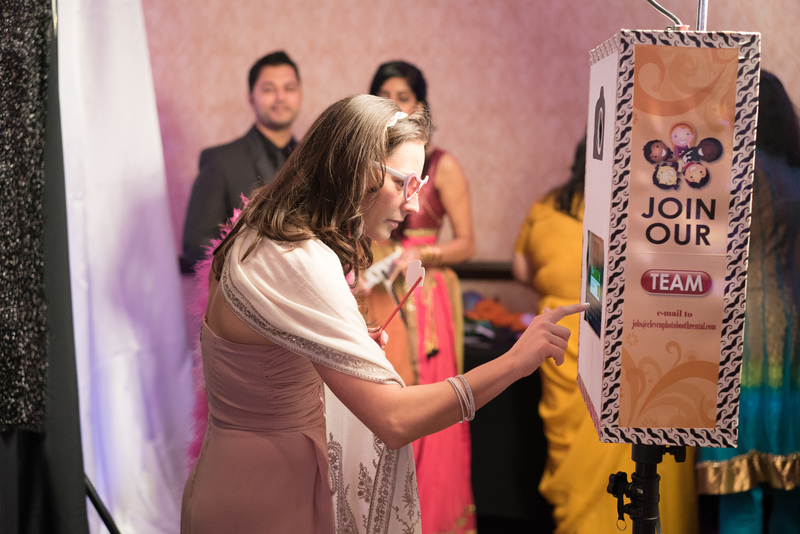 Since we were in India, we got our invitations there too. The trip was 10 days total so placing orders within the 1st few days was critical. I went ready with the text for the invitations. They finished them while we were there and we even brought them back with us. 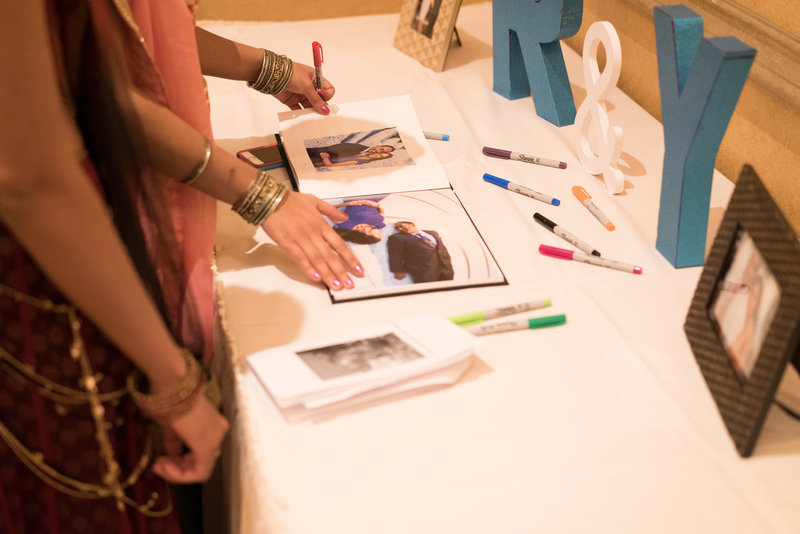 What advice would you give brides planning their wedding? I would recommend getting a planner or more importantly a day-of-coordinator or a team to help with all of the little things that take place that day. Leaving things to family and friends to do is really difficult and chaotic, especially the little things. Otherwise things fall through and much is left undone and the events are delayed. 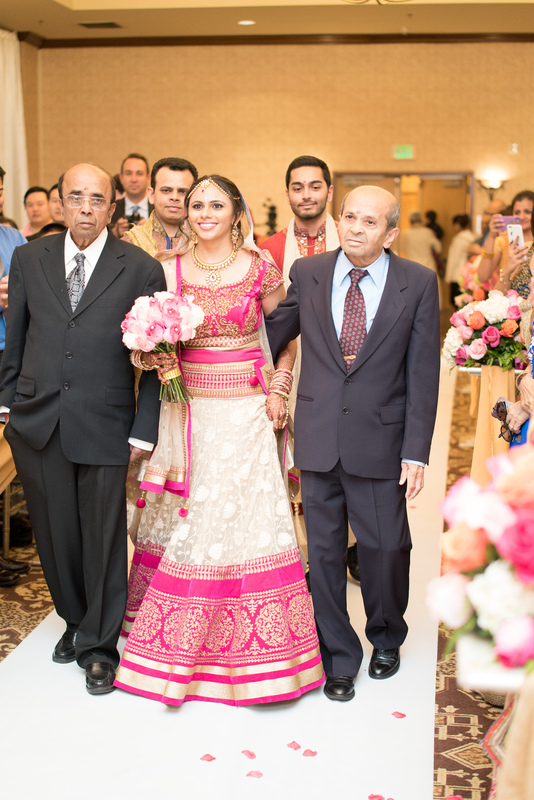 We were really lucky to have Shilpa and all of the friends and family who came together for us. Schedules – what time each event (i.e. 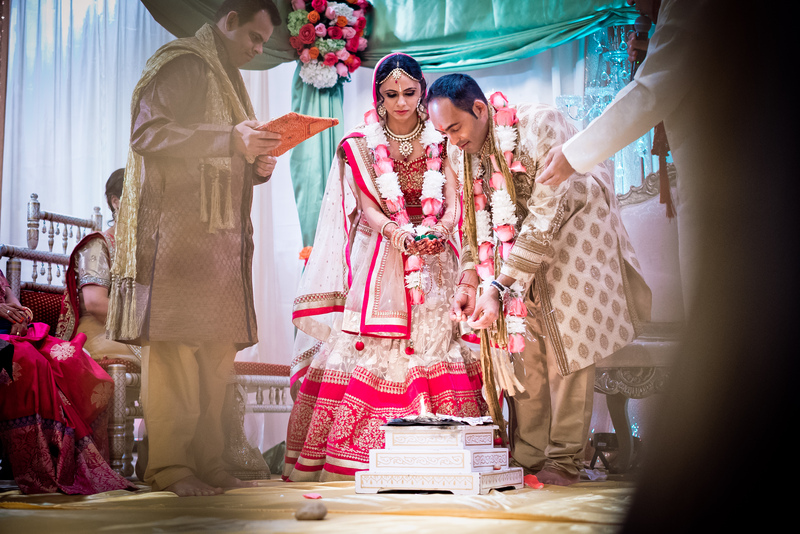 pictures, baraat, vidaii, lunch, any poojas) is supposed to take place. Shilpa helped us build a detailed timeline with everything noted so that the coordinators were aware of the chain of events and made sure things were ready (i.e. 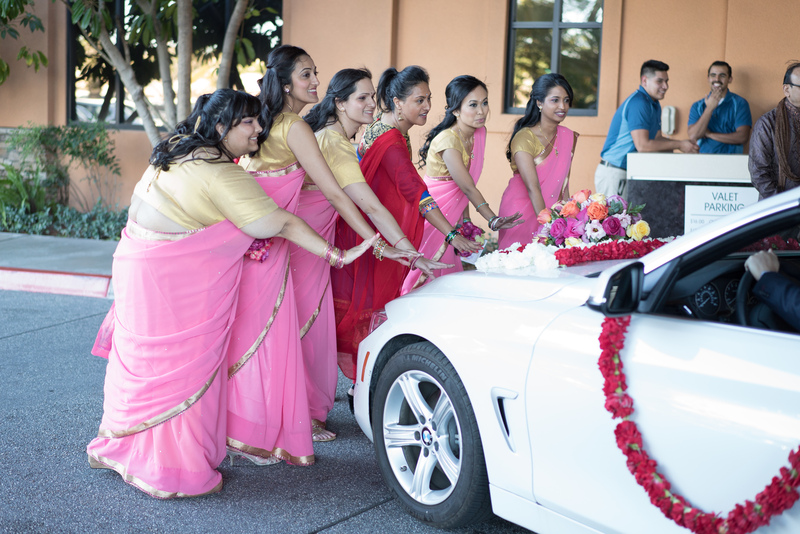 car for the baraat and vidaii, any pooja materials). What materials/equipment each vendor is responsible for bringing, this is generally provided in contracts i.e. 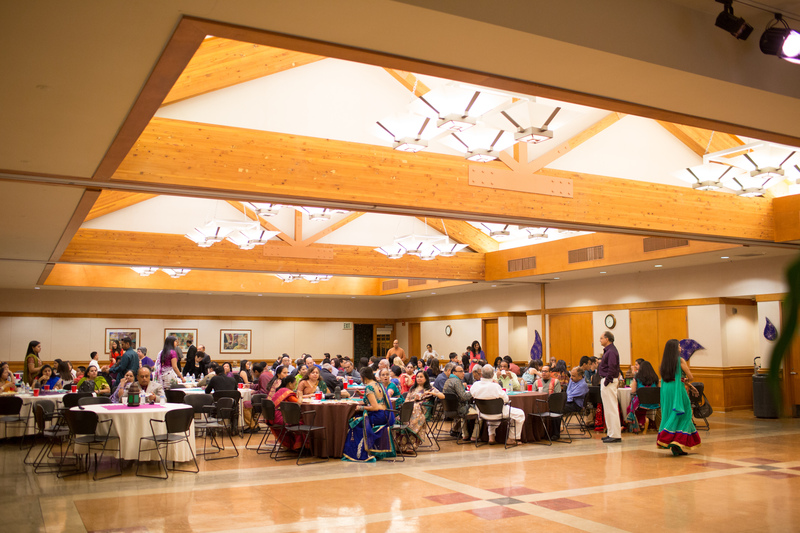 what equipment the caterer is providing vs. the venue, who’s bringing the haar’s for Varmala? 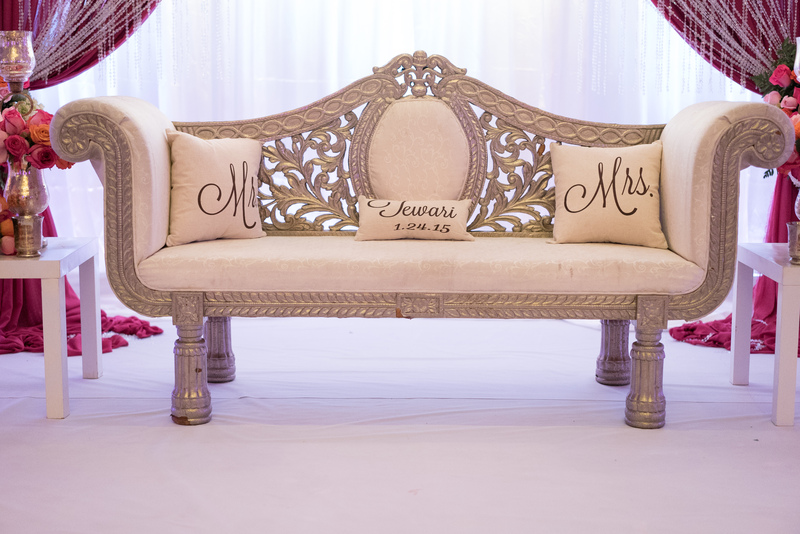 The layout and designs for the day – how tables and chairs are supposed to be setup, mandap size and design, lighting designs – that way the day-of-coordinators can check and double check everything is as it should be. 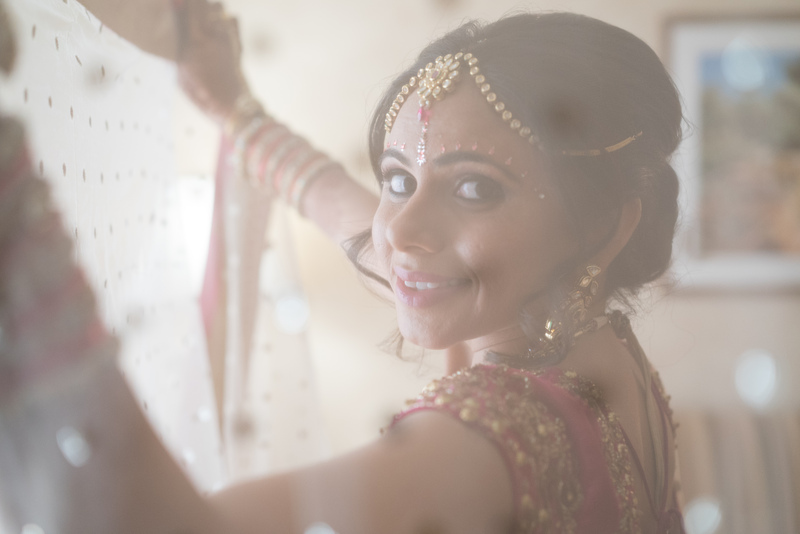 3) Most importantly, be the go-to person(s) the day-of the wedding to ensure everything is running on schedule and all the vendors are doing what they’re supposed to be doing as well as assist in any unforeseen situations. 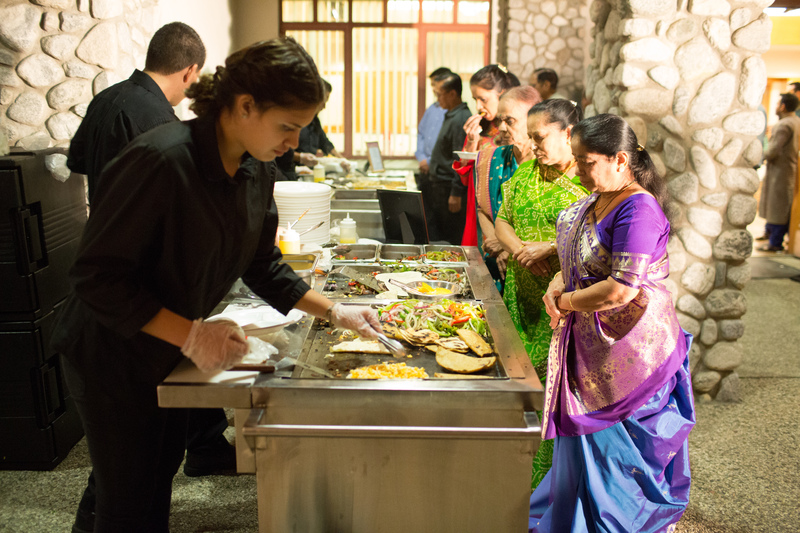 Catering Sangeet: The Mexican Taco. They were very flexible, punctual, and professional. Jose Zakany Photography also did the photography for the weekend. They were great. 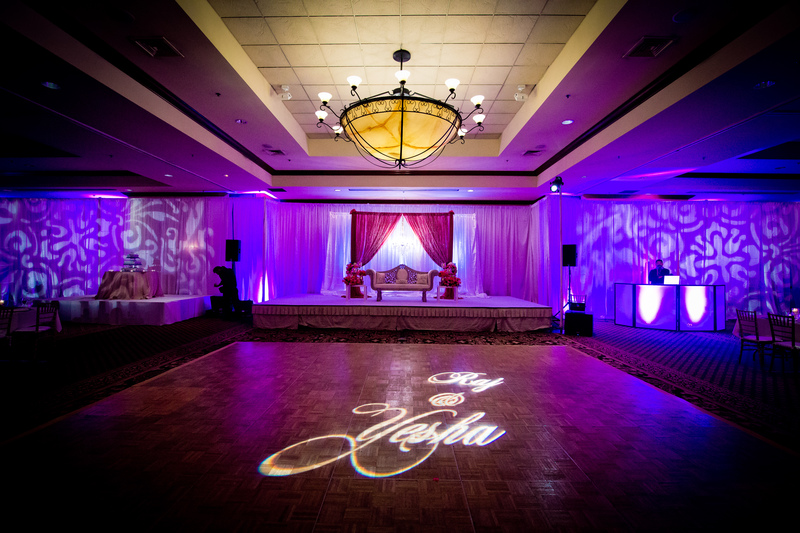 We were really happy with their lighting, name decal and DJ work all day. 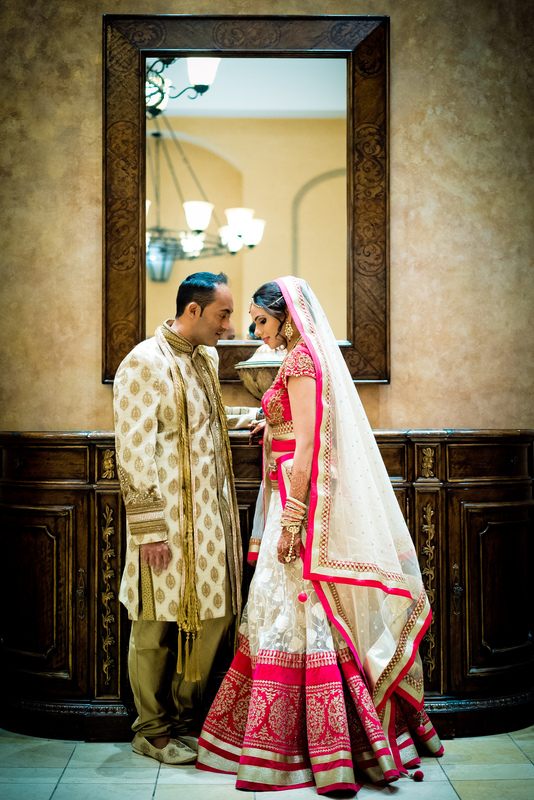 Working with Deepti was seamless. She really understood what I wanted; I didn’t have to go back and forth with her. It was great! Lishma is great! 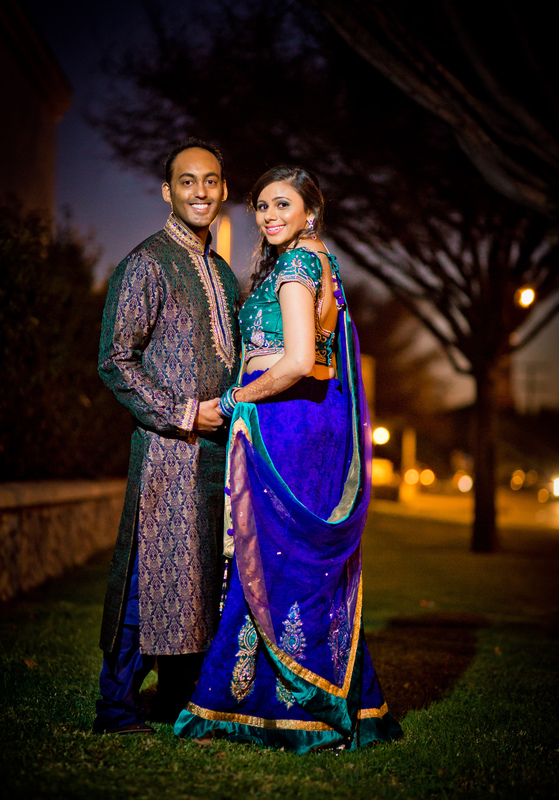 I loved my mehndi, hair, makeup and draping of the dupattas for the wedding and reception outfits. She did an amazing job! 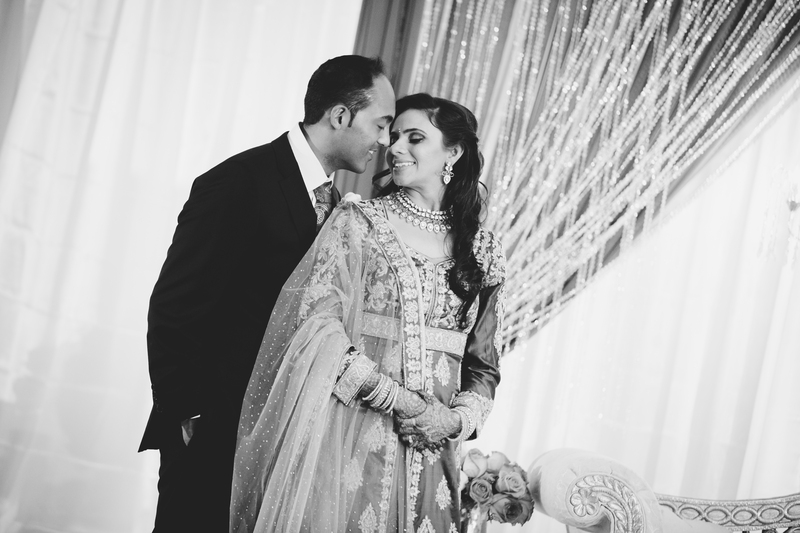 Shilpa is an experienced planner – very meticulous in everything she does. 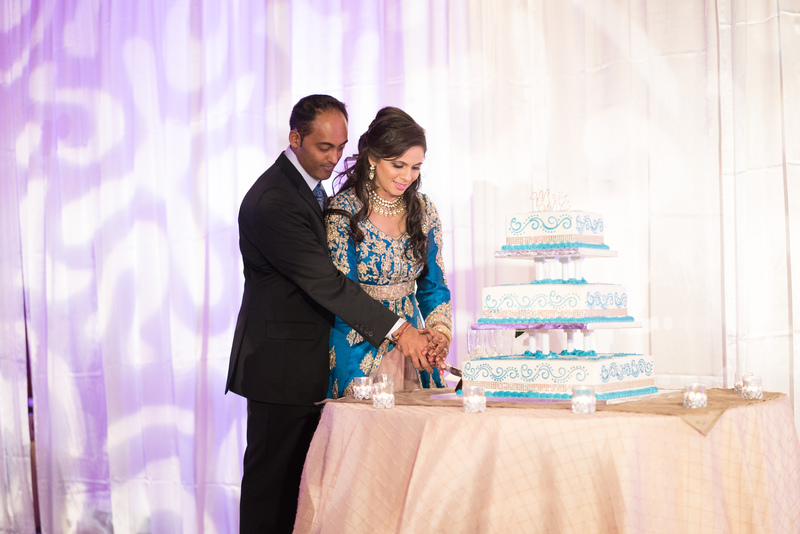 I couldn’t have had such a perfect wedding day, without her and her team from start to finish! She helped me every step of the way, I have her to thank for the wonderful memories!